On a warm summer evening along the ridgetops of West Virginia’s Allegheny Mountains, thousands of bats are on the move. They flutter among the treetops, searching for insects to eat and roosts on which to rest. But some of the trees here are really metal towers, with 30-meter-long blades rotating at more than 80 kilometers per hour even in this light breeze. They are electricity-generating wind turbines—a great hope for renewable energy, but dangerous for bats. The flying animals run into spinning blades, or the rapid decrease in air pressure around the turbines can cause bleeding in their lungs. By morning, dozens will lay dead on the ground. Countless more will die at wind turbines elsewhere in the U.S. and Canada in the forests and fields of the Midwest and the windy prairies of the Great Plains. Much of this slaughter—the greatest threat to animals that are a vital link in our ecosystem—was supposed to end last year. In 2015, with great fanfare, the American Wind Energy Association (AWEA), a trade group, announced voluntary guidelines to halt turbines at low wind speeds, when bats are most active, which would save lives. Conservationists praised the move. But some scientists say this promise falls short. The industry plan claims to reduce bat deaths by 30 percent, but holding the blades in check just a little longer could reduce deaths by up to 90 percent or more, a decade of research indicates, and would do so with little additional energy loss. A research review published in January of this year found that wind turbines are, by far, the largest cause of mass bat mortality around the world. White-nose syndrome, the deadly fungal disease that has decimated bat populations throughout the northeastern U.S., came in second. Biologist Cris Hein of the nonprofit group Bat Conservation International says that if the current industry practices continue and wind turbine installation grows, bat populations already weakened by the fungus will crash. Industry has balked at holding the blades still at higher wind speeds, however, saying the energy loss will be larger than scientists claim. Bats eat insects, saving farmers billions of dollars in pest control each year, but they generally do not get much attention. No one was even looking for bats under turbines until 2003, according to wildlife biologist Ed Arnett, currently a senior scientist at the Theodore Roosevelt Conservation Partnership. But on routine checks for dead hawks and eagles under West Virginia turbines that summer, surveyors found an estimated 2,000 dead bats. The discovery prompted creation of the Bat and Wind Energy Cooperative - a consortium of federal agencies, the wind energy association and Bat Conservation International. The consortium hired Arnett in 2004 to conduct the first major studies of why turbines kill bats and to find solutions. In what is now considered a classic study at the Casselman Wind Project in Somerset County, Pa., in 2008 and 2009 Arnett “feathered” the blades in the evening hours of bats’ critical fall migration period. Feathering involves turning the blades parallel to the wind so the turbines do not rotate. Arnett feathered blades at wind speeds of five to 6.5 meters per second, slightly above the cut-in speed – the speed at which the turbines connect with the power grid—now typical in the industry, which is 3.5 to four meters per second. Delaying the cut-in speed reduced bat deaths by 44 to 93 percent, depending on the night studied and conditions. And delaying turbine starts until slightly higher wind speeds during this two-month migration period, Arnett estimated, would only reduce annual wind energy production, by less than 1 percent. 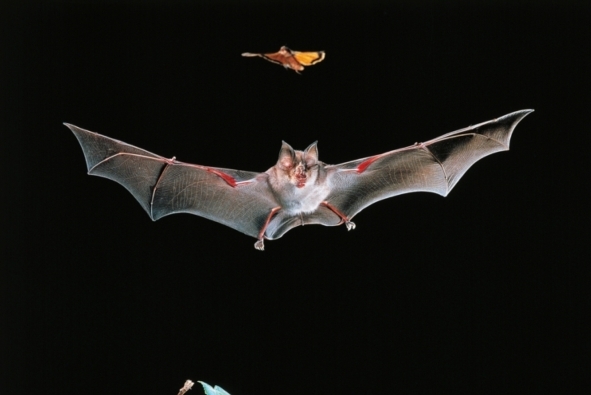 A flurry of research by other scientists followed, showing feathered blades and higher cut-in speed saved more bat lives than other proposed solutions. Paul Cryan, a bat biologist with the U.S. Geological Survey and a co-author of the January bat mortality review, praised the industry’s voluntary guidelines as an important first step. But like Cris Hein, he worries about the ongoing impact of turbines on bat populations. “Bats are long-lived and very slow reproducers,” he says. “Their populations rely on very high adult survival rates. That means their populations recover from big losses very slowly.” He questions whether bats can handle such damage year after year. Defending the wind turbine policy, John Anderson, AWEA’s senior director of Permitting Policy and Environmental Affairs, says the guidelines were just a first move, not necessarily the last. “The initial step was to find that sweet spot between reducing our impact while maintaining energy production levels that make a project economic,” he says. Now the U.S. Fish and Wildlife Service (FWS), part of the bat consortium, is weighing in on the debate, and it appears to be following the conservation research. In a draft Habitat Conservation Plan covering eight Midwestern states the FWS proposes raising turbine cut-in speeds to five or 6.5 meters per second to protect three bat species listed (or being considered for listing) under the Endangered Species Act. One such species is the Indiana bat. To date, few other bat species are officially listed as endangered, including those most frequently killed by turbines. And the FWS can only require action by a wind facility if it has proof that the facility killed an endangered Indiana bat, a difficult task without close monitoring. Right now, “many, many, many facilities within the range of the Indiana bat” do not participate in any plan, says Rick Amidon, a biologist in the FWS’s Midwest office. The service hopes that a region-wide Habitat Conservation Plan will make it easier for facilities to opt into good conservation practices in advance, before the bodies of endangered species appear under their blades and the FWS takes action. The public comment period for the proposed plan closes July 14. The situation right now puts Hein and other conservationists in a difficult position. “We see the impact of climate change on bats, and so we’re in favor of renewable energy,” Hein says. “It’s unfortunate that one of those—wind energy—has this negative impact.” He is frustrated that industry has not acted more quickly on existing studies but acknowledges “it’s hard to get an industry to move on anything very rapidly.” In the meantime he and the consortium will keep searching for the ultimate environmental sweet spot.